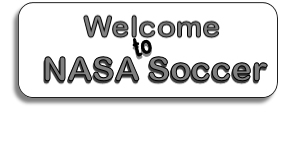 NASA is a not for profit recreational soccer club located in Noble County Indiana. As of this date, there are two communities - Albion and Kendallville. NASA is registered and governed under the Indiana Soccer League (ISL). The board members and coaches are all volunteers. NASA starts their season in the fall of each year and continues in the spring of the following year. 12 games are played on Saturday's throughout each year. 6 games in the fall and 6 games in the spring. 3 games are played at the Kendallville Sports Complex and 3 games are played at Albion Hidden Diamonds each fall and spring. Churubusco's Soccer club has recently joined us in games and are scheduled to compete between the two NASA communities. The age groups are between 4 and 14 (we will accept a 15 year old as long as they are still in 8th grade). We follow the typical soccer age classificatons of U6, U8, U10, U12, U14. The 'U' stands for 'Under'. The age cut-off is the age of the player at the age they are on August 1. Example: If a player is 7 and his birthday is on July 30th (and turns 8), he would move up to the U10 division however, if that same player's birthday was on August 2nd and was turning 8, that player would still be considered a U8. Players can always play up a division but only under certain circumstances down. NASA was founded by Dale Harmeyer, Greg & Tina Bowen, Jay Hayes, Gary Fry, Mike Uszake and Bridgett Fry in 1994. Their goal was to provide a soccer organization that was both fun and educational for the entire county.